Thank you so much for this brilliant recipe. Both my mother, husband and I love this sourdough bread. The only bread I have ever baked so far has been sourdough, and I only started this year. The recipe I had was not giving me the results I wanted. So I decided I needed an alternative. So I found your site and decided to try out you “New Fav”. Wow!! I didn’t have time to let the dough rise for as long as I would have prefered, but it still came out beautiful. I shaped it slightly different. The crumb was fine but and soft, and the crust was ever so slightly chewy. Just Perfect. Thank you so, so much!! Btw. love you blog, will experiment with lots more! When you proof in a basket, seam up is best because then the basket can simply be turned over to invert the loaf (seam side down) onto the pan or peel. hi Susan such a nice bread !!! First of all you are my bread baking heroine. Full stop. 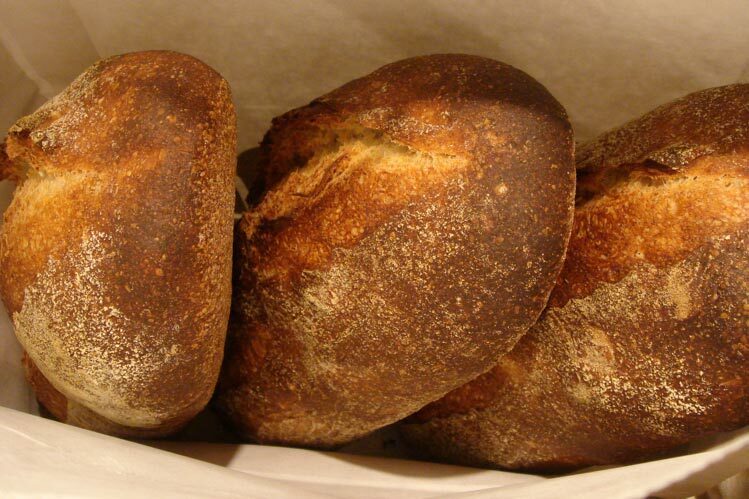 Many thanks for your adaptation of Hamelman’s sourdough. Me too ! Thanks to you this is now my favorite sourdough, as well. I just made 4 loaves for the Easter weekend (plus 2 batches your Pain de Beaucaire) for all of my returning Easter bunnies and their kidlets. Even the littles loved the sourdough toasted with sweet butter and blueberry jam. The last loaf was made into ham sandwiches for the road. I made one batch with my rye starter and the other with my whole wheat starter. Naturally the rye had a little more “bite”, but both were super good. One of these days I’ll get my son to help me upload a few snaps….right now I’m useless. Thanks again for your impeccable directions and your inspiration. Bellissimo questo tuo pane, l’ho fatto anche io ed e` buonissimo! Se vuoi vederlo, lo trovi qui sul mio blog. Just wanted to give you feedback on this recipe. I was really pleased with the results, very good ‘softer’ crumb then the previous sourdough I was making from Dan’s ‘Handmade Loaf’ book which was a lovely change. Nice crust too. mixed the ingredients up last night until I had a well combined dough and left it in fridge. took it out this morning left it to come to room temperature…then shaped it and left it to rest again on floured baking sheets ready to go into oven…and baked it…this is the method I find hassle free. I did leave it to overprove which I often do with distractions from kids etc which meant it didn’t rise as much as I was expecting but it had no effect on the taste & texture of the loaf.. I want to try it again with just white flour for my middle daughter who doesn’t like the extra sourness from the rye flour..
Can I use Barely malted flour. I can’t find all purpose malted four anywhere. Angel, you should be able to obtain King Arthur All Purpose flour. It is malted. Malt is usually not mentioned anywhere on the label of most flours, but if you read the ingredients of most flours that are suitable for bread making, malt will be listed in the ingredients. If you cannot locate any King Arthur, you should be able to find some Gold Medal Better for Bread. It is also widely available, and suitable for this recipe. Thank you. I didn’t know that KA All-purpose is malted. I used KA bread flour and that seems to work as well. I’ve cultivated my very first ever sour dough starter and it’s bubbling nicely. Really looking forward to trying this as it looks great! Much love from Oxford, England. What would happen if you were to retard these for, say, 20 hours in the fridge? My dough is just sticking to the hook and going for a ride. is this normal or what can I do to fix this? For Step 1 under method, with the mixer running on about 1-2, I put in the water and then the starter and mixed those together to for a very thin slurry. I then added the flour, with the mixer still on low, and scraped the sides of the bowl until all the flour became incorporated. I let the dough rest (autolyze) for the 30 minutes. I then turned the mixer back on the incorporate the salt, mixing for only about 20-30 seconds on low. I then turned up the mixer to 6-7 (mine goes to 14), until the dough was being slightly flung off the hook so that it couldn’t stay on the hook where it had climbed up. I then mixed the dough for 4 minutes this way. This seemed to work perfectly. hi! I just love this recipe! However, I am not able to achieve a nice crust, as it’s always too soft, and is crusty once out of oven, and perhaps an hour more. After that, it’s just soft. May I have some advice? thanks in advance! p.s writing from Malaysia where humidity levels are really high! I’m a bit confused. I’m new to bread making, and in all your recipes that call for a starter, you never specify what kind of flour the starter should be made of. Is that because it’s assumed that all starters are white flour starters? I made this recently and gave a loaf to a friend. Well the yesterday evening they stopped by and we shared a bottle of wine together while the children were out playing. The wife said “oh by the way” and then told me how wonderful that loaf of sourdough was. She had grabbed a store bought the same day. And in side by side taste tests the Norwich Sourdough was much better. In fact her kids requested the Norwich not knowing that it was homemade. An amazing recipe thanks for sharing it. I live in Bogota, Colombia, at 2800 meters above sea level, and i had my doubts about the recipe… Well, it turned out awesome; maybe a little denser than your pics, but that can be due to the lower percentage of O2 in the Air, causing the bacteria to work slower. Also, there are VERy few flours to be bought here, and in wheat only all-purpose and baker’s flour. Rye is OK to be found. The importance of using fresh baker’s flour is crucial to a good bread; if I use all-purpose, it’ll become a brick. Your blog is just super! Congrats! First I read your answers over the years. I’m an apprentice in baking bread. But, with your good recipes and tips I’m amble to bake nice bread. Still I have a question; how do you get such a beautiful grayish color on the Norwich sourdough? 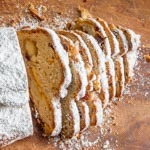 Connie, the crumb color comes from 1) using unbleached flour, 2) using coarsely ground whole rye flour, and 3) avoiding overmixing, which breaks down pigments (and these also contribute flavor, so you really don’t want to break them down!). I stumbled across your site while looking for a recipe for my white elephant bread- crispy crust and big holes in the crumb. Hello, just stumbled upon your fab website and thought you may like to know a sourdough starter trick I learned in Spain many years ago which was to put two or three UNWASHED grapes into the starter at the beginning and remove next day and the yeast on them would be enough to get it all going quickly. Great bread! After several times doing it I found that the ftemperature during fermentation and the fact that the is ripe have a major affect on the results. At low temperuture I either extend the time or using the lamp of my stove to get higher temperature. I have a standard simple oven. How can I create steam in it for this bread. I wish to make it but don’t know how to give it the steam you’ve mentioned. Would be ever greatful for your help! Many thanks!! I read Jeffrey Hamelman’s book last year, and remember trying out the proportions of this recipe. I think my starter (I grew it in September) wasn’t at full strength, and I had a lot of trouble. I’m trying your version today, and hopeful that I have good luck. I don’t know if it’s the weather lately, but my breads haven’t been as good as I’ve wanted, and as they have been in the past. Who better to turn to than you to get me back on track?! Thank you for your wealth of information! Thank you so much for post this recipe. Like many others I had such a success with this recipe. I went through 10 pounds of flour and 5 batches of bread before I found your recipe. This batch came out perfect. In fact it’s the best bread to come out of my oven yet. Thank you, thank you, thank you! You can check out the batch of bread here: http://littlehomesteadinthedesert.blogspot.com/2011/03/sourdough-success.html at my blog. I really enjoy this site and find it very helpful. I was wondering why you couldn’t do the bulk rise overnight in the refrigerator after the second turn, take it out in the morning, let it come to room temp for about an hour, then proceed with the initial shaping, bench rest,etc, rather than holding the shaped loaves in baskets overnight in the fridg? I find that when I do this I have trouble with the linen towel sticking to the loaf, then deflating it when I try to remove it no matter how well the baskets are floured. I’ve been using your sourdough recipe for months, and I absolutely love it! 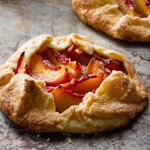 Have you had any success with adding any dried fruit or nuts to the dough? I’ve tried a couple of times, but I can’t seem to get the loaves to rise much during proofing or baking. Should the dough be kneaded longer to develop more gluten (to support the add-ins)? Hi I came accros your recipe on tfl. I couldn,t wait to try it. I,m still pretty new to bread baking especially sourdough. I just put up the dough this morning. I thought i had it all scheduled out right but of course things came up. The dough ended up rising for five hours at room temp before i could get home to quickly get it in the fridge to at least retard. I hope that won,t mess it up. I,m going to go shape now and bake tomorrow morning. I’ll let you know how it comes out! I’ve been making your Norwich sourdough bread for over a year now. It’s my standard recipe for the household making it twice a week. To change things up, I substitute wheat or white flour instead of the rye. It always comes out great. Last week I substituted Bob’s Read Mill No. 1 Duram Wheat Semolina Flour. This substitute gives the closest to a traditional San Francisco sourdough that I’ve been able to achieve. It’s chewier and gives a slight nutty taste. hi roman; thanks for tip re semolina. i’ll try using it. my first loaf didn’t rise much but i still loved it. the texture was light and loose. i’ve got one ffermenting right now. my starter may not be strong enuf tho. i cut the recipe in half and i’m going to put the loaves into loaf pans. This was my first attempt at a true sourdough bread, and it came out wonderful. Thanks to your insight, from well explained recipes to the shaping videos, I tamed the wild yeast. What a service you provide to the world with your knowledge. 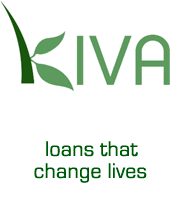 I’m forever indebted to you. I’ve been making this on sourdough on a regular basis and the results have been mostly fabulous. just made this today – amazing!!! I love that it doesn’t require hours upon hours and days upon days to make. Granted, it’s not a very sour flavor this way, but for a “quick” 100% sourdough it’s great! Next time I do want to try retarding in the fridge overnight to develop the flavor more. Thanks for posting this great bread recipe! I tried this one over weekend. And this one is a keeper!! Amazing flavor!! The bread has very mild creamy sour taste, which is how I prefer any sourdough bread. I finally was able to get back on track with my poor, 2-month neglected sourdough starter and made your norwich sourdough. I was so happy with the results and that I was able to still shape a batard after not baking anything for a few months. I don’t have that much experience with bread baking as it is, but this has given me the confidence to try my hand at a lot more! Tonight, I’m making another batch but I’m going to increase the hydration by 5% and see what happens. Cheers! Everyone is lovin the Norwitch….Thanks! Its my first edible sourdough leaf! I would like the dough to rise a bit more during proofing. Mimi, for a less slack dough, you may need to add less water, or develop the gluten more by mixing it longer. Also, if the loaves failed to spring much in the oven, the loaves may have been overproofed. David, dense crumb can mean you need more water in the dough, less or more mixing, and/or longer or shorter proofing. I.e., it could be just about anything! I’m planning to write a post about dense crumb soon. Thanks Susan. I just baked another two loaves, one sprang up amazingly in the oven, the other when I slashed it ( still practicing the technique) didn’t rise as much but still beautiful. I may try the less water & see what happens. Don’t think I am over proving as after the rest/retard they go to the fridge overnight & baked in the hot oven the next day. Will try less water & see what happens! Hi there. I think my starter is ready to go and I am anxious to bake some sourdough, however, I have neither a couche nor a banneton nor any other type of shaping device other than a solitary crappy old nonstick loaf pan. I do have an enameled cast iron dutch oven. Can I proof and bake it in that? Or is there another trick? For baking, a preheated cast iron dutch oven can be used in lieu of a baking stone. I made this bread today and it turned out wonderfully. I got loaves with a thick, crunchy, golden crust and moist, slightly sour interior. I think this is one of the best breads I’ve ever baked! Thanks for sharing! Susan, your blog is a joy! 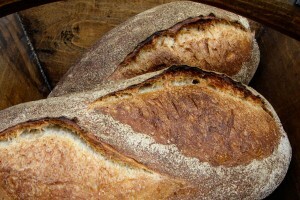 I spent yesterday baking Finnish Rye, 47% Rye, Miche with Wholewheat starter and am finishing off two Norwich loaves. After a little practice, and taking my courage in both hands with the Finnish Rye (to paraphrase, “it’s dough, but not as we know it”), I am confident to recommend your site to anyone new to sourdough baking. Particularly the Norwich- what a little star! My humble thanks. When you say mix for 3-4 minutes, do you mean in a KitchenAid-style mixer or a commercial one? Bob, this is in a home countertop mixer. However, you should judge sufficient mixing by gluten development, not by the clock! Thanks Susan. I don’t go by the clock. Just curious, as it takes me longer (maybe 7 minutes) to get to moderate development. I *loved* your suggestion to save some of the dough for pizza. We tried it last night and it made a wonderful crust! Can’t wait to do it again! Thank you. I’m just pulling my loaves out of the oven, my first bread from captured yeast. Your directions were excellently clear. Hi! 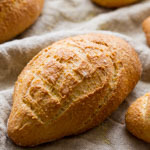 I am new to bread making but exited to learn nice and new recipes, and I have a big, bread-loving Russian family to please so I am very happy to have found your site! I am sure they will love those breads! I just have a couple questions, I just don’t understand what a 100 per cent humidity sourdough mean. Could you explain in cups of water and flour?? Also I have a rye flour starter on hand, could I use it for your recipes? can I feed my starter with a different amount of water and flour to make it more stiff or liquid? The last thing is that I do not have a baking stone, can I bake bread on a simple oven tray and get a proper result? Thanks for your help! bye! Hi Susan, I’ve been making your “New Favorite Recipe” and wonder if I can leave my proofing bread refrigerated for more than 16 hours? My goal is to achieve a more sour bread, but I don’t know if this would be over proofing. Would it cause the dough to rise more? I would like that but you have said that over proofing causes the bread to have a more dense crumb – not what I want. How does over rising cause a denser crumb instead of an airier crumb? Then again, is over proofing the same as over rising? Just some of the bug-a-boos I am trying to work out. Thanks so much for your site – I’m loving it. Susan, I am also wondering about the mixing whether to use the dough hook or just the mixing attachment. I currently use both – the mixer first and then the kneading paddle when mixing in the salt. I also read Bob’s post about possibly mixing longer than 3 – 4 minutes, which I believe I need to do next time for better gluten development. Should this dough meet the “stretch the dough in front of a light” to test for perfect gluten development? Sorry for all the questions, I am quite new to sourdough bread making. So many thanks. 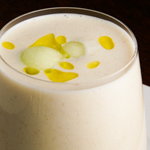 Mallika, 100%-hydration means the starter contains equal parts of flour and water by weight. If you use a starter with more or less water you will need to adjust the amount of water in the final dough to compensate for that. If you use a rye starter you may wish to use only white flour in the final dough, unless you are experienced with rye breads. Marie, leaving the loaves in the refrigerator for longer results in a more sour bread. At low refrigerator temperatures, acid production by bacteria continues, while yeast fermentation slows way down. If they are left too long, the high acid content will start to break down the gluten and eventually the loaves will be a gloppy mess. Try 16 hours and see if the sourness is to your taste. I use only the dough hook when I use my stand mixer. Susan, I have read on your other post about maintaining yeast where you try to always keep 100g of starter. The Norwich recipe calls for 360g starter. I assume you started with an amount from your master starter, fed it till it matured to 360g? What are there measurements in cups??? Glen, to get 360 g, just don’t discard as much on the final feeding before baking, and feed with additional flour and water, keeping the ratios the same. I reached the point where I turned the 400g bits into balls and then shaped them. You said I could leave it out for just over an hour and then put in the fridge overnight. I’ve done this and I still have about 8 hours to go in the fridge but I noticed that the dough has risen LIKE CRAZY!!! i put the shaped dough in a suitable shaped container that fits its shape and covered with a cloth and then sealed it with a plastic bag, but the dough has burst out of the cloth and is almost expanding the entire plastic bag. should this rise be happening? Or have I dont something wrong? If its risen so much, could I just take it out now (after about 10 hours in the fridge) and put it straight in the oven? Im just a bit afraid Ive done something wrong because your images of the shaped bread look sturdy and hard, whereas mine is still quite wet and floppy…? Susan I so enjoy this recipe! The dough is a delight to work with, the proofing time for the shaped loaves is so flexible and the end result is delicious – however – for some reason I cannot manage to get ‘ears’ on my loaves? Do you have any idea what I might be doing wrong? Any suggestions, ideas or advice would be greatly appreciated. Thanks for a wonderful recipe and website! I tried your recipe twice. Both times I failed. First time I made a mistake (added the salt right at the beginning) so let’s ignore that. I used KA bread flour and organic pumpernickel… My starter is relatively young (about 2 weeks old) but is very active and I’ve successfully baked with it. David, do your loaves seem overproofed (see below) when you bake them? If so, you may want to leave them out for less time before putting them in the fridge. Also, check your dough temperature. If it’s high, the loaves will take more time to cool down in the fridge. 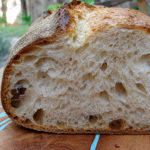 See this post on how to control dough temperature (which should be around 76F for this bread): http://www.wildyeastblog.com/2007/07/05/water/ . Once they’re in the fridge, you can leave them there for 2 – 12 hours or longer, taking them out to bake (straight from the refrigerator) when you’re ready. Lisa, good ears depend on a few factors: sufficient gluten development, tight loaf shaping, and watching your to make sure that the loaves are not over proofed so you get some “oven spring.” Also, make sure you hold your blade at a shallow angle to the bread surface, so your cut makes a “flap” of dough. MoonshineSG, it sounds like your loaves are overproofing! Proofing time should be judged by dough readiness, not absolute time. 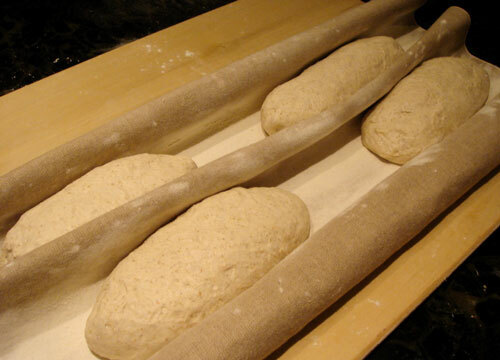 Temperature (of the dough and the room), flour composition, hydration, and other factors can affect proofing time. The dough is proofed and ready to bake when a fingertip pressed lightly into the dough springs back slowly. Just wanted to thank you so much for the recipe and the information you continue to provide to folks following your blog. I am most especially appreciative of the video you provide on folding the dough for this sourdough. I have a million cookbooks, and many are dedicated to bread, but the video made all the difference in my sourdough baking. I’ve probably made this bread 15 or 20 times in the past six months; in fact, I find myself looking for excuses to make it because it’s so darn good I want to share it with people. I’ve tried adding jalapenos and shredded cheddar when I shape my batards and am quite successful with getting a scrumptious jalapeno cheddar sourdough from this recipe. My husband (who claims he doesn’t like sourdough) has been on me to bake for him since I took some time off from baking this summer. He came home the other day with two jars of jalapenos and told me he knew I could put them to good use. And my 6-year-old is seeing bread-baking as a part of our family routine, so that’s another thing I want to say thank you for. This recipe has made it so easy! Came to this after several attempts with the Tartine recipe which works well but is very demanding on time (4 hours withs folds ever half an hour). Your method has many similarities but is less “extreme” and in my experince much more reliable. I have had great sucess with it and am now using a slightly adapted method with more water (60 gms added with the salt), and turning 3/4 times to make up for the extra water. I follow your timngs for overnight fermentation and bake it dark like Chris Robertson at Tartine does and the crust ends up really crisp and almost shatters when you cut it. I guess I am some way between your method and his. My contribution to the extensive discussion/teach in on starters and feeding schedules etc in this chain is that I use half white bread flour and half rye. I keep it in the fridge between bakes and, provided it has only been there a week or less, I just take a spoonful out and use it directly to make you 360 gms of levain. Works every time. Hello and thanks for a wonderful recipe!! Is it because I don’t cover the outside of my dough with a lot of flour when I’m done shaping? Or is it maybe because I seal it with a plastic bag while its resting for 2.5 hours? should I be letting in some air so that its outside hardent a bit the way it looks like in your 2nd to last image? I would try this recipe but too lazy to convert Metric to AMS. I have been trying to get this to work for a while. It always tastes great! But my trouble is that the dough won’t hold it’s shape after it leaves the shaping container. I use the stainless mixer bowl buttered and floured. Also tried ONLY butter or ONLY flour and when I dump the dough it’s hard to get it out (very sticky) and just flattens. I end up having to reshape it into a Boule right before baking. It still tastes good and the texture is fine, but I’d like to have it keep shape after it’s proofing time. by the way I follow the steps above. I usually use Wheat Montana wheat flour in place of the Rye, but I also tried Rye flour. Just put some sunflower oil at the inside of the bowl and swirl the dough around so there is a little bit of oil everywhere around the dough. Then give it a rest. It works for me. 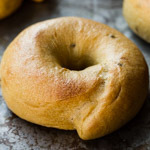 If the dough is not sticking but you still have trouble with the boule deflating after you remove it from the bowl, it may be overproofed, or the shaping may not have been tight enough. Thank you for posting this lovely recipe, and thank you for providing such detailed instructions. I recently jumped on the sourdough bandwagon and have been churning out bricks up until I tried this. 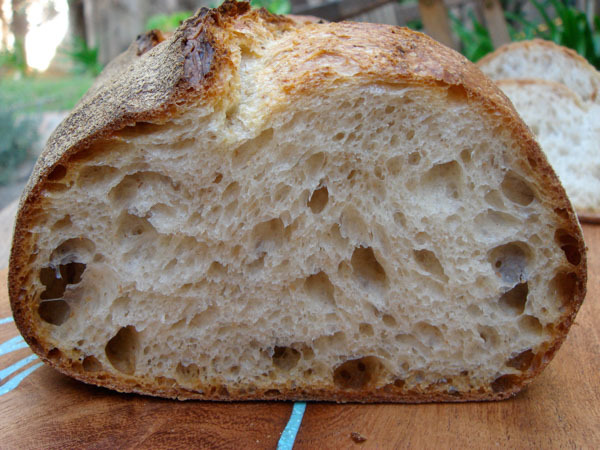 Great, pillowy, open crumb and wonderfully crisp crust. Love it! May the bread gods always smile upon you!